I'm rubbish at golf. I don't play enough, but I'm not going to give up because I like the game immensely. If I can keep my head down and play through the ball I can hit some decent shots. Putting is OK for a hacker, chipping needs a bit of work. Driving is simply atrocious. Playing with my pal Pat Loftus yesterday showed me how far I've got to go. 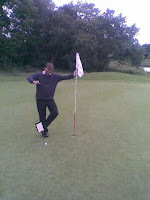 Still, one of us won "nearest the pin" on the 7th at Worsley Park. It wasn't Pat. To date it is the only thing I've ever won at golf apart from a few Euros from a badly hung over accountant called Jason Hiley. This pic is the proof, though the word of a chartered accountant of some repute should be enough too. A pro on the same competition, Harry Proos, also got a hole in one. But he's a pro.